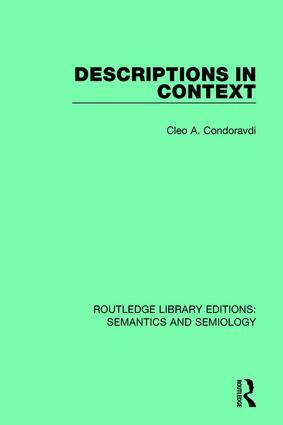 First published in 1997, this book focuses on the semantics of definite and indefinite descriptions — taking the presuppositional theory of definiteness and indefiniteness proposed by Heim as a starting point. It seeks to show that there exists a special type of indefinites that have an interpretation commonly associated with definites. It further argues that the felicity conditions associated with indefinite NP’s can vary and develops a more fine-grained theory of novelty within the framework of File Change Semantics. More generally, this work can be seen as providing an empirical argument in favour of a dynamic theory of meaning and against the more traditional truth-conditional theory.